"The Launch of the North West America at Nootka Sound, British Columbia, 1788," Robert Pollard, 1790, Toronto Public Library. 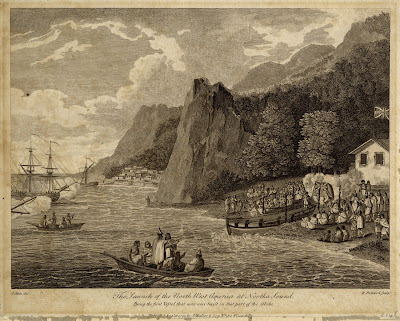 Taken from the book Voyages Made in the Years 1788 and 1789, from China to North West America, this plate purports to show "the first Vessel that was ever built in that part of the Globe," despite showing a Nootka vessel in the middle foreground. Though not so ceremonial as you'd see at the slipways of Deptford, the naval personnel present do their best to give it a sense of gravity. Clouds of smoke, perhaps from firing a salute, cloud the ground behind the stern of the North West America. Among the clouds stands a pair of naval officers. At the stern of the vessel, and clutching the flagstaff, is a common tar. Jack wears a fur Canadian cap atop his head, and a double breasted jacket (that ends at his waist) buttoned shut. Broad fall white trousers, closely fitted to his legs, finish his slop clothes.